Caden Bowers fires a pitch for Warsaw in sectional action at Penn Thursday night. The Tigers lost 5-0 to No. 10 Penn. MISHAWAKA – The Warsaw baseball team put forth a fine effort Thursday night. It just was not good enough to beat a fine team like perennial power Penn. The No. 10 ranked Kingsmen proved worth of their lofty status by blanking the Tigers 5-0 in a first-round game of the Class 4-A Penn Sectional. Penn takes a 25-4 record into semifinal play Saturday versus Elkhart Central (19-9) at approximately noon. Penn defeated Central 2-0 earlier this season. Central defeated Goshen 4-2 in the first game Thursday night. The Blue Blazers scored three times in the opening inning by taking advantage of three Goshen errors in the frame. Northridge, which defeated Concord 13-0 in five innings Wednesday night in the sectional opener, will meet Elkhart Memorial in the first semifinal Saturday at 10 a.m. The sectional final is scheduled for 11 a.m. Monday with the champion advancing to the LaPorte Regional on June 2. Warsaw sees its season end at 7-17. The Tigers drew the tough task of facing Penn for the second time in the last six days. The Kingsmen, who were state runner-up a year ago, beat Warsaw 14-1 in five innings in the championship game of the Tiger Tournament last Saturday. This time around, the Tigers turned in a much better performance. 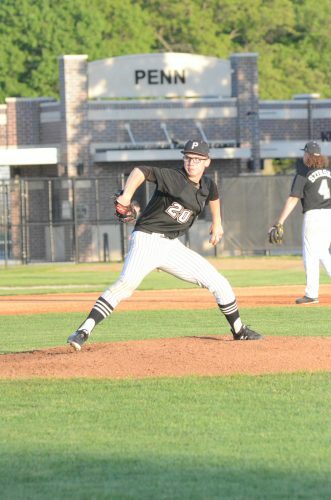 Warsaw trailed just 1-0 through four innings before Penn pulled away late for its 25th win in its last 26 games. “I loved our effort tonight,” said Warsaw coach Mike Hepler. “Our kids played really hard and did not back down. We have nothing to hang our heads about. We had two good days of practice Tuesday and Wednesday and were ready to play tonight. Penn, which is bidding for its fifth straight sectional title and 22nd overall, took a 1-0 lead in the home half of the first inning. Leadoff hitter Nathan Vargo smoked the first pitch he saw for a double. Brock Boynton moved him to third with a groundout to second and Ryan Lynch drove him home with a sacrifice fly to center. Sophomore Lynch, the ace of the Penn pitching staff, has already committed verbally to Notre Dame. 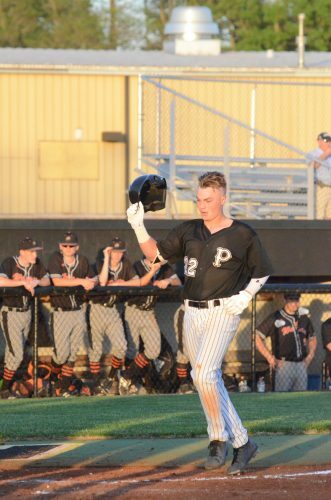 Penn’s Brock Boynton reaches home plate after hitting a solo homer. The Kingsmen, who have won four state championships under Hall of Fame coach Greg Dikos, cushioned their lead with three runs in the fifth frame. Boynton made it 2-0 with a solo homer to right field that banged off the scoreboard. Penn made it 3-0 on a stolen base and a throwing error and then 4-0 on a sacrifice fly by Marshal Furner. Penn added an insurance run in the sixth on an RBI single by Lynch. Penn starter Kameron Koch went six sterling innings on the hill. The junior lefty allowed just two hits while striking out eight and walking two to raise his season mark to 6-0. Junior Kegan Hoskins worked the final frame for Penn. Warsaw stater Caden Bowers went a solid five and two-thirds innings. The junior lefty gave up five runs on 10 hits with two strikeouts and two walks. 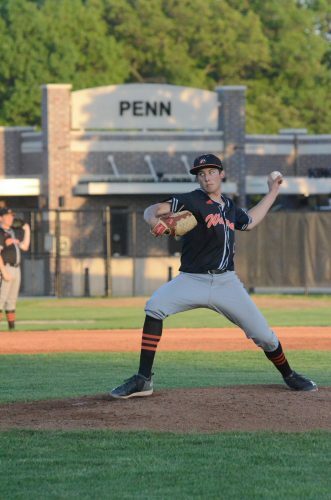 Junior Ian Glogovsky went the final one-third of an inning for the Tigers, striking out the only Penn hitter he faced in the bottom of the sixth inning. The Tigers made a pair of outstanding catches in the outfield, one each by right fielder Michael Nunez and left fielder Kyle Kuhn to keep the game close. 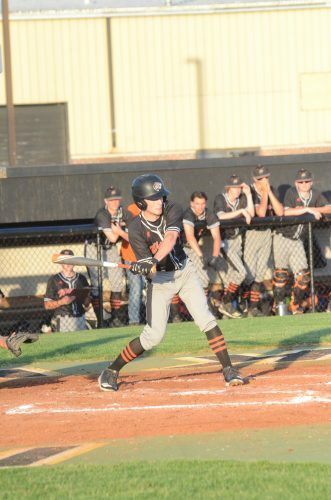 Junior Liam Patton had both singles for the Tigers, one to lead off the second inning and another in the fourth frame. The Kingsmen played errorless baseball and also got a defensive gem in the final inning as second baseman Hayden Berg went high to snare a liner and fired to first for a double play. Penn catcher Nathan Lovisa also threw out a would be base stealer at second and picked a Warsaw runner off first base in the contest. Penn, which began its season 0-3 with losses to Carroll, Carmel and Northridge, has now won 19 in a row since a loss to Lake Central. The Kingsmen were 27-7 a year ago and lost 4-3 to Cathedral in the Class 4-A state title game. Coach Dikos, now in his 31st season as head coach, owns 18 sectional titles and 10 regional championships. He went over 700 career wins last season. Warsaw says good bye to seniors Kuhn, Nunez, Brendan Perry, Jared Hawley, Matt Francis and Matt Shapiro. Five of the six were in the starting lineup Thursday night. A Tiger takes a swing.